Code Black's series finale premieres tonight on CBS at 10pm; written by Joshua Troke and directed by Rob Bowman. I had the great pleasure and privilege of speaking with Code Black's showrunner, Michael Seitzman on the eve of the show's series finale. It is very clear in talking with him that he has a great love and pride for this show and all of the people involved; speaking glowingly of everyone from the camera operators to the music supervisors; and most especially the fans and viewers, giving them closure. He stated that he believes it's his job as the showrunner to make everyone feel as if they 'own' the show. And I feel that it is this principle and the attention to EVERY tiny detail that makes the show feel so authentic; swaying between intellectual and emotional, perfectly. For example, the song Superman (sung by Briana Lee) figures prominently in the finale with Rob Lowe's Ethan coming to the realization that he can't save anyone else before he saves himself. It was written by John Ondrasik who has been working, beautifully, on the music for season three. They brought in a gospel choir and organ music to add to the breath-taking, deeply emotional feeling of the episode. Luis Guzman's Jesse/Mama has always referred to Angels as a 'civic cathedral': "when people come to the ER it is for two reasons: to die or for a miracle." And when Leanne refers to this in her monologue during the courtroom scene near the end, it brings the show full-circle from season one. Having lost her entire family in season one as did Ariel with her father, they both had to survive. It was in the 'village' of Angels that they found something and someone to survive for; "a mantra for the show." Mr. Seitzman refers to Code Black's cast as the best cast; "no emotional drama or egos, all nice guys, no 'hidden monsters' in the bunch. We really are like a family, spending a great deal of time together not just on-set, but off-set as well." The table reads sounded like an especially exciting and emotional time during the production of the show. He referred to them as "one big party." They were held in a large room on the studio lot and treated as a family dinner/live show. The actors would usually perform it like a play, reading it cold and everyone from lawyers to crew would come to watch. He would also inform the guest stars to bring their A-game because Marcia Gay Harden ALWAYS did. Mr. Seitzman was kind enough to share with me his idea for a season four and it sounds fabulous. The show is based on Ryan McGarry's award-winning documentary Code Black. And it is from this documentary that Michael finds ever more inspiration for a possible season four. In the doc the original LA County-USC Medical Center, where McGarry trained as a resident, is closed and moved to a new location. Watching the doctors and nurses, in the doc, trying to come to terms with this unfamiliar space which seems devoid of the humanity and the 'ghosts' of the original LA County, he thought this would be a great idea for season four. He was also inspired by the fact that the real-life doctors who would come to visit the show's set would be visibly moved by the similarities between Code Black's set and their original hospital. He found them to be very connected to and nostalgic for that original space. And don't we all feel like that about some place in our lives? I, personally, can not drive past my childhood home without bursting into tears. The idea could resonate with people on so many different levels. Since an airplane has already crashed into Angels in the finale and all of the sets have been broken down, what better way to start out season four, keeping it on par with the documentary? Also, Mr. Seitzman feels that Code Black hit its stride in season three. I concur, as do the millions of other fans/viewers out there. 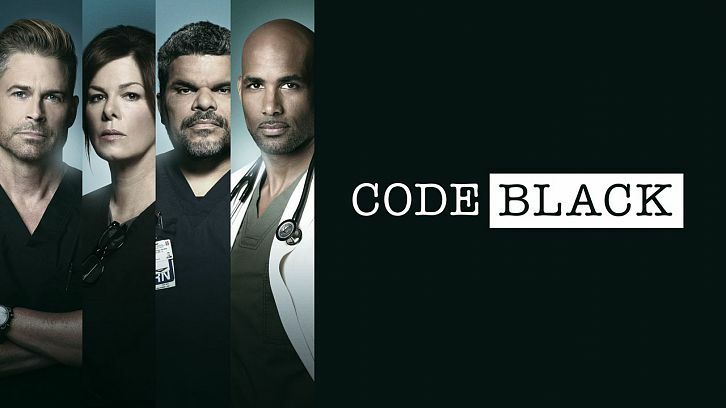 And speaking of millions of viewers, Code Black won its timeslot, yet again, last week with 5.72 million viewers! So I asked that ubiquitous question: "how can a show winning in the ratings with a cast that includes Marcia Gay Harden, Luis Guzman and Rob Lowe, just to name a few and an all around incredible cast and crew not get picked up by the network? Michael: "I saw the writing on the wall when they moved us to the summer timeslot and there would be almost a year between season two and season three. Those decisions happen behind closed doors that we are not privy to and we never find out why. We don't even ask, really. It would be like asking someone why they broke up with you." That is a succinctly beautiful answer, also quite hilarious. Mr. Seitzman is also the showrunner for season three of ABC's Quantico which will wrap-up it's three year run on August 3 with a two-parter filmed on location in Ireland. When I asked what it was like to act as executive producer for two shows at the same time, he said that the most difficult part was the two month overlap in production between the two shows; especially since Quantico was filmed in New York and Code Black in Los Angeles. I asked him when he finds the time to sleep. He's trying to catch up a little at the moment, but with his recently formed production company, Maniac Productions, having twenty-three projects currently in the works, I don't see much down-time in his future. One of those projects is a show based on John Grisham's 1976 novel The Rainmaker. Michael: "I've been calling Mr. Grisham every year or so for some time now to ask if I could develop it. And he finally relented."